On Thursday afternoons, I often participate in a discussion on Twitter about community health centers. It is a ‘TweetChat’ that uses the hashtag, ‘#chcchat’. Most of the participants are from the United States or from Canada. However, we’ve also had participants join us from as far away as New Zealand and Australia, so I’ve come to think about community health centers internationally, but I’ve still thought of them as being predominantly Western European or English speaking. Today changed my view about community health centers. 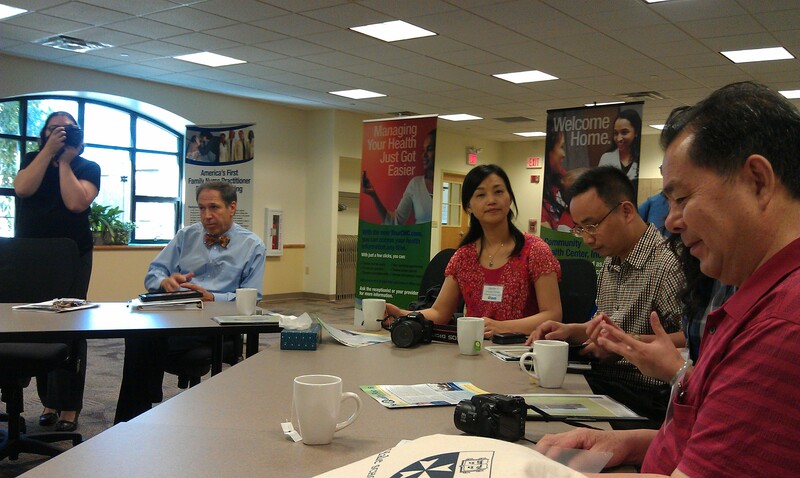 We had guests visiting our health center from China. They were in the United States as part of a program with Yale’s School of Nursing, and besides people from the Central South University School of Nursing, there were people from a Chinese Community Health Center and the Chinese Department of Health. We sat around a table, talking through an interpreter, about issues that Chinese Community Health Centers face. The topics we covered sounded fairly familiar. How can community health centers expand the ways nurses can be involved in providing medical care? What should the roles of Advanced Practice nurses be? How do you get people interested in primary care at community health centers instead of going to large and more expensive hospitals? What are the best ways to organize a community health center? What is done for ongoing training of medical staff? Now that I’m back at my office and have a chance to do a little research, I’m finding interesting articles about Chinese community health centers. A 2006 research article, Service utilization in community health centers in China: a comparison analysis with local hospitals, provides a great starting point. One of the things I particularly enjoy about working at the Community Health Center in Connecticut is that we get opportunities to join in on discussions with people about how to provide world class service to the people of Connecticut. Sometimes, these discussions are simply with our internal quality improvement teams, sometimes, it is with leaders from the most forward thinking community health center organizations around the country. This morning, it was with dignitaries from China. Whether you are talking about improving health care in the United States or half way around the world in China, community health centers focused on wellness, prevention and primary care are an important part of the discussion.